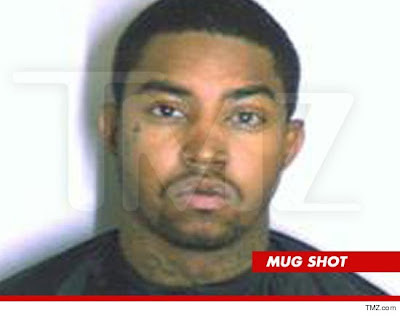 That mugshot is from the last time Lil' Scrappy was arrested on a violation of his probation. And now, not even a year later, Scrappy finds himself behind bars once again. When will big teef learn that getting locked up aint a good look for him? According to TMZ, around 2:33 a.m. yesterday morning, Scrappy got into a fight inside of a gas station after a man disrespected his girlfriend Bambi. An off-duty police officer just happened to be in the gas station at the time and broke up the fight. When the on-duty po-po showed up, both men were arrested. Scrappy has since been released and told TMZ that the victim was the aggressor, "He was calling my girlfriend names and then put his hands on me - I had to put them paws on him." Yes, he really did say that. How much you want to bet that Bambi was the one who really started the fight? I can just imagine her running her mouth and popping those big azz gums to get the men all riled up. Apparently there is a video of the altercation floating around on the web but I'm too lazy to look for it (or maybe I don't care enough to look for it) but maybe it does prove that Scrappy was only defending himself. Hopefully Scrappy's lawyers can get him out of this one. He's too old to be fighting and he has a bunch of mediocre music he should be working on. Stay focused, man! What do you think about Lil' Scrappy being arrested for defending his girlfriend Bambi? Follow Real Reality Gossip on Twitter & Like Us on Facebook! That's his old mugshot tho. I need to see a new one!